“The Bluebook: Citing to Basic Sources” has just been added to the Law Library’s Legal Research Seminars TWEN course. This new “Bluebook” Seminar is an updated version of a previous Seminar. Stay tuned – we will be adding more updated Seminars, and new Seminars, over the next few months. Remember, the Law Library’s Legal Research Seminars are continuously available on the Westlaw TWEN platform. View a Seminar, then complete that Seminar’s quiz to earn points. When you earn 100 points, you are awarded a “Law Library Legal Research Letter of Recognition” and a Digital Badge, which you can post to your LinkedIn page. Seminar points are good for the entire time you are here at C|M|Law, and you can earn multiple Letters of Recognition and Digital Badges. 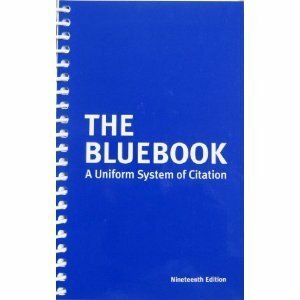 The Nineteenth Edition of The Bluebook, A Uniform System of Citation has arrived at C|M|Law. The editors of the new edition made changes in favor of clarity, concision, and consistency. Among the changes, the Bluepages have been reworked and renumbered. Now the Bluepages provide information on citing to Electronic Case Files (ECF) documents. Also, do not be alarmed if you search for B13 because it is gone. Hint: it was typeface conventions. Additionally, there have been several change to the rules. For example, the editors substantially revised Rule 18 The Internet, Electronic Media, and Other Nonprint Resources to allow increased citation to Internet sources. Rule 18.2.1(a) provides the writer guidance on citing to authenticated and official Internet sources as well as exact digital scans of print sources as if they were the original print source. Rule 18.2.2(a) states that when no author of an Internet source is clearly announced, the author information should be omitted from the citation, unless there is a clear institutional owner of the domain. Rule18.2.2(b) now expands the rules for citing to webpage titles of main pages and subheadings. For a complete list of the revisions, please check out the reference list compiled by Cynthia Pittson, Head of Reference Services and Adjunct Professor of Law at Pace Law School.